The demand for western-style modernity threatens the heritage of many of India's smaller cities. The Rainiwari Canal still survives, passing through the outskirts of Srinagar, a historic city distinguished by architecture reminiscent of a medieval European city. But, the Mar Canal, which ran through the heart of the city, was filled in and converted into a road. Almost a century ago Mark Twain characterized India as "the land of dreams and romance ... of fabulous wealth and fabulous poverty." Today, India is a land teeming with a population three times that of the United States on a land area one third the size, a land with almost a third as many cows as people. A more recent traveler noted that, "India had too many people, too many animals, too many customs, too many gods‑too much of everything." The intensity of the country never fails to heighten the visitor's awareness of history, traditions, modernity and human life itself. Last year I traveled to India to undertake a research and documentary photography project. Once there I found a nation that values its heritage yet is striving to modernize. Evidence of the conflict between the two goals is everywhere. Faced with a population growth of nearly one million per month and vast poverty, how can India give historic preservation a high priority? The question does not arise for the Taj Mahal, the Hindu temples at Kajuraho or the caves of Adjanta and Ellora. Such monuments are protected by legislation passed in 1904 and expanded in 1951. But in small cities and towns throughout the country, vernacular structures are being Destroyed y in the name of progress. When author V.S. Naipaul wrote, "India is old and India continues," he identified a condition about the country's culture that also applies to its built environment. Indian cities are filled with old buildings, all of which continue to be used, lived in, worn out and rebuilt, but their existence does not mean that they have been preserved. Preservation is a conscious act, not a description of a condition. In India a traditional way of life continues together with many historic buildings. But the demand for "progress" threatens to erase a great deal of the historic resources. 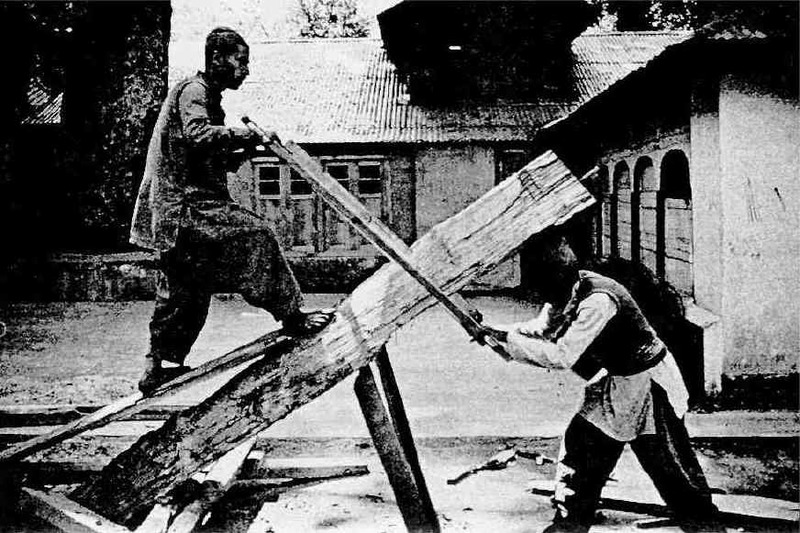 Men continue to saw timber as they have done for centuries in a village outside Srinagar (bottom left). This condition presents a tremendous opportunity and a major problem. The historic buildings could be restored and adapted so that continuity with the past is not erased. However when there is radical technological change, increased wealth and a demand for modernity, few structures are considered sacred; change is often radical, irrevocable and entirely out of scale with what remains. In overcrowded cities like Bombay, extreme land shortages have driven prices up to New York City levels. While development, pressure threatens many of the older neighborhoods, poverty, neglect and intense overuse cause rapid deterioration of many historic buildings. This phenomenon occurs not only in Bombay but also in Delhi, Calcutta and the ancient walled cities of Ahmadabad and Udaipur. 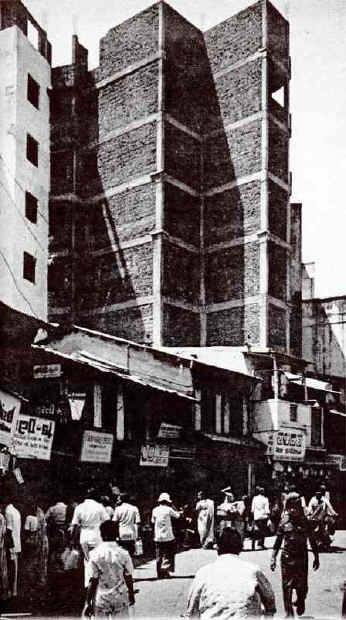 A 20th-century apartment building in Ahmedabad stands in stark contrast to smaller, older structures (below right). India's harsh climate often makes efforts at preservation nothing less than heroic. Every year during the monsoon season, dozens of buildings collapse in Bombay, and many others survive only by being hastily propped up with wooden supports. Last July a record monsoon struck Jaipur, the 18th-century city founded by the Maharaja jai Singh and known for its pink buildings. In three days more than 36 inches of rain fell, burying many of the city's historic sites under silt and causing the collapse of 2,000 buildings. India's historic environment faces an even greater threat than mother nature-the demand for western-style modernity. The destructive effects of this demand became particularly clear to me on my visit to Srinagar in Kashmir, a state in northern India. Every morning the women of Srinagar do their washing on the banks of the Rainiwari Canal. A traditional way of life in India coexists with modern industrial practices. As I arrived, I gazed upon a wonderland of winding canals and picturesque lakes surrounding the city, flanked by the towering Himalayan Mountains. Initially, the central area of Srinagar seemed a jumble of rickety buildings and houses, narrow congested streets and a constant bustle of activity. Earthquakes have struck Srinagar quite regularly, shaking the seemingly fragile houses into extraordinary angles. The architecture of Srinagar with its steeply pitched gabled roofs atop brick and wooden structures reminded me of a medieval European city-not a restored city like Marburg in Germany but a medieval city still alive and lived in as it has been for centuries. Buildings have been added, others removed or radically altered-but what we see in Srinagar is a mixture of buildings built and rebuilt over the last 300 years in a compatible style. Never, until recently have new buildings clashed with the older structures. 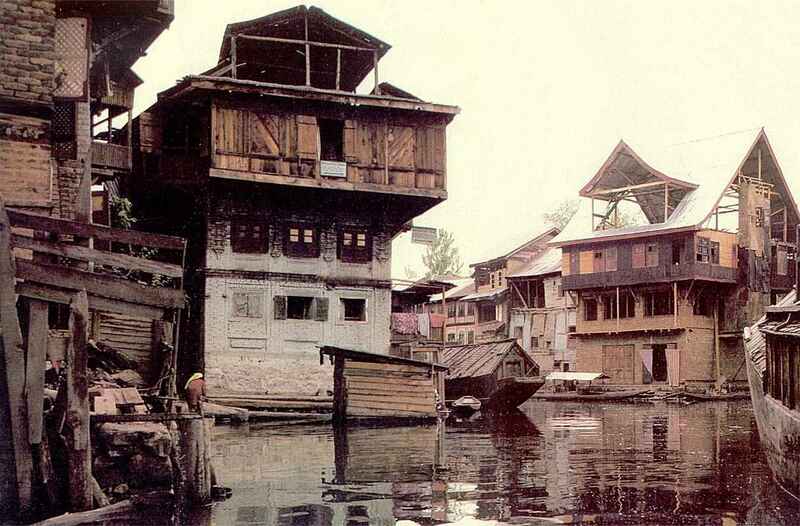 And, with its economy based on handicrafts and carpet weaving, Srinagar has never had the local wealth necessary to undertake a massive rebuilding of the city. 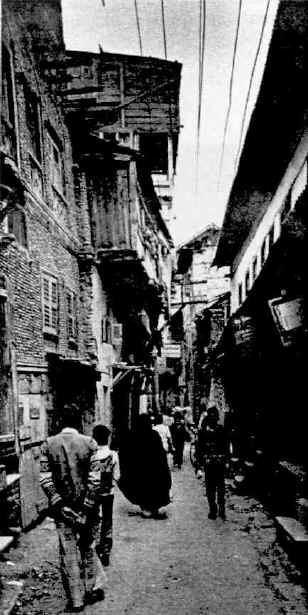 Many of Srinagar's old narrow streets remain intact, but the construction of new roads threatens many of them. 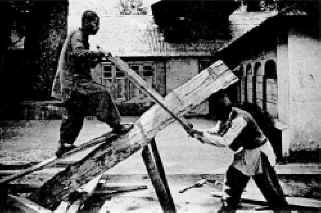 In addition, Srinagar remained relatively insulated from western influences for centuries. 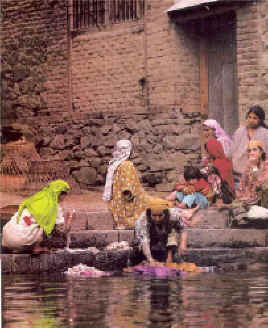 The Kashmir Valley became a popular vacation spot for Europeans during the late 19th century, but they were not allowed to own land and thus had little impact on the historic city. Instead, they stayed in picturesque houseboats on nearby Dal Lake, establishing a whimsical waterborne vacation paradise that remains famous today. I had read the 1842 account of an English visitor's boat trip through the Mar Canal, one of the ancient canals in the city, and was fascinated by the description. "Its walls of massive stone, its heavy single arch bridges and landing places ... the gloomy passages leading down upon it betoken the greatest antiquity." In my search, I found parts of other canals that answered the 1842 description, but the Mar Canal was gone. Built by the Muslims in the 15th century, it had given the city its reputation as the "Venice of the East". But now it has been filled and converted into a two-lane road. More than 600 of Srinagar's oldest buildings were destroyed in this redevelopment, which included the construction of new shops that more resemble rows of powder magazines than an attractive new market. 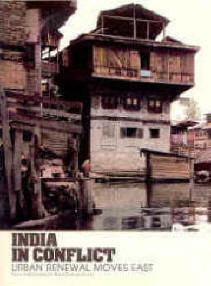 Srinagar had at last entered the 20th century and had been subjected to its first modern-day urban renewal. The new Mar Road obliterates the historic pattern of streets and collides with the historic city. The new shops, with their concrete walls and flat roofs, were not designed with any respect for the steeply gabled brick-and-wood houses behind them. The canal had been used as an open sewer, but, ironically, the proposed sewer line under Mar Road was eliminated in a budget cutback. In the final analysis, the new road and redevelopment was meant to show what the entire city could look like in the future. The resemblance of this scheme to urban renewal projects in the United States is not accidental. Many of the architects and planners in India have been trained in the West, and planning ideas that only recently have been questioned in the U.S. and Europe are still popular in Asia. The conflict of progress versus preservation is even more apparent in the case of the Dal Project, which will provide sewer connections to the houseboats moored along Dal Lake. However, while improving sanitation, the project threatens the lake's character. The plan calls for organizing the boats into rigid clusters, dredging out the floating gardens and removing many of the picturesque clusters of farmers' and weavers' houses that have existed on islands in the lake since the 19th century. The project even includes a new road on a viaduct that will pass between the houseboats, destroying the peace and tranquility of this vacation retreat. Modernization in third-world countries is often done in the name of tourism. Tourists are not expected to tolerate the decay and lack of amenities that the local people have endured for generations. Yet in the process of modernizing a city, the very qualities that attracted tourists in the first place can inadvertently be sacrificed. This point became even clearer in the fabled desert city of Udaipur, a walled bastion of castles, palaces, gardens and takes. I came to stay in the city's most famous monument, the Lake Palace, built by the maharaja as an island retreat in the 18th century and now operated as a five-star hotel. When I first looked at the Lake Palace, I found that the magical quality I had expected was not there. The hotel is still very beautiful, but it has lost the transcendent quality that had made it one of the wonders of the world. During the 1970s, I learned, most of the former palace had been demolished to make way for new hotel rooms. Many of the cupolas and details had been reconstructed, but the scale was different, and the visual effect was lost. I was confronted with a familiar problem: How do you preserve the character of a historic structure when adaptive use requires major design changes? In Udaipur it is a continuing problem. A similar palace at the other end of the lake is presently being reconstructed as a hotel. What is happening in Srinagar and Udaipur is repeated in many other cities. In Ahmadabad, for example, the city walls have almost all been removed to provide land for new development. And the Chinubhai House, the most splendid and unusual mill owner's mansion in the city, is to be replaced by ordinary blocks of apartments. The Chinubhai House, a mill owner's mansion in Ahmedabad, faces demolition (below). The 1910 house, combining western and Indian architectural styles, will be replaced by a block of apartments. These situations in Indian cities demonstrate one of the most common preservation problems in both the East and the West: It is usually the most important buildings that are most threatened. The focus of human activity that had made the buildings important provides the mechanism for their eventual destruction. The discovery of their value is usually in time to save the last example of something, but rarely in time to save the best. Like the Sufi story of the man who had to disfigure himself to achieve enlightenment, it seems that it is only after witnessing such destruction that people later discover the worth of his­toric artifacts and their own need for them. I did find that an awareness of this need is beginning to grow in India. It is the urban equivalent of the discovery of one's own soul. Places have souls too, and that soul is the collective record of the common culture. To a preservationist from the West, India provides a unique chance to enter a world existing in a time warp. For in India preservation doesn't mean merely saving the physical remains of a past and forgotten way of life. There, the rich, old culture itself is still alive. In India the concept of preservation is not known as we know it in the West, simply because so much of the country still lives in the past. The combination of a modern industrialized existence with a historic pre-industrial way of life enhances the richness of the culture. It is important that this quality not be lost. Randolph Langenbach, a Cambridge, Mass., architect, photographer and historic preservation planner, spent six months in India last year under a grant from the Indo-U.S. Subcommission on Education and Culture.